Signe Haller It is with deepest sadness we announce the peaceful passing of our mother Signe Mariana Haller on December 09, 2017 at the age of 91 years. Mom, one of six children, was born in Houston, B.C. to Emil and Ellen Widen. Mom was predeceased by the love of her life, husband Henry Haller in 2003 and her special son in law Bob Davoren in 2017. Sadly her son Raymond has passed to join her Dec 15, 2017. 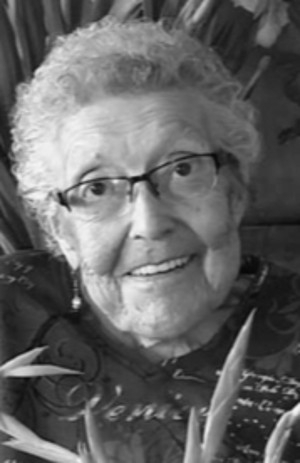 She leaves to cherish her wonderful memory and very full life, four children, Peggy Davoren of Kamloops, Jude Flaman of Prince George, Lola (Dan) Larocque of Prince George, Lyla (Gene) Hornby of Kamloops, many special grandchildren , great grandchildren, nieces and nephews. She is also survived by her sister Maryellen Schon of Prince George and daughter in law Karen Haller of Champion AB. Mom spent her early years being raised in her beloved Bulkley Valley embracing a busy hardworking life as a farm girl. Early on she learned the value of hard work and her strong determination speaks to the proof that she could put her hand to anything and succeed. After graduation she spread her wings and moved south to Kamloops where she met our dad Henry Haller. A match made in heaven, they married in 1945 and spent 57 wonderful years together. Mom worked many jobs in her early years while raising a family. She moved from Kamloops to Prince George in 1969 and retired as a bookkeeper in the early 80's from Woolco. She loved music, played 6 or more instruments well and mom and dad spent many seasons playing in a country band at various dance halls in the Interior. She was a member of the Moose Lodge Ladies and loved bowling and crocheting. After retirement mom and dad spent many healthy years doing what she loved best. Camping at Cluculz lake , fishing, hunting and travelling to visit friends and family became the norm. She especially loved her yearly trips to Reno with daughter Peggy and son in law Bob. Mom's love of family and friends is legendary, she was quick to help anyone who needed it and was clearly jaw dropping with her quick wit and sense of humor. Mom always had an extra plate at the table for anyone who needed it. Growing up as children we had many occasions to have other children live with us whom mom cared for lovingly as her own. Mervin S always held a special place in her heart. Health issues over the past number of years prevented mom from going very far. Daughter Jude selflessly moved in with mom to help and care for her in every way. Earlier this year mom was not able to stay at home and moved to Simon Fraser Lodge in Prince George. Thank you to the wonderful staff for the love and support she received in the months she spent at the lodge. Thank you to her wonderful support group of friends who visited often and brought her gifts of kindness. Words are not enough to express our sincere thanks to Dr. M. Nadeem for his special care and concern of our mom. He has a special place in our heart. There will be no service at mom's request. She and dad will be laid to rest in Kamloops Hillside Cemetery in the spring. Cremation arrangements entrusted to Prince George Funeral Home.